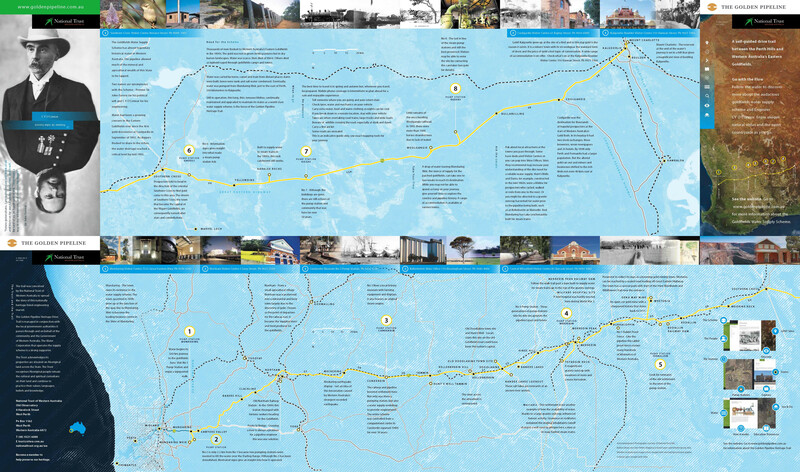 The Goldfields Water Supply Scheme is a historically significant and economically invaluable water supply as well as an engineering marvel. The scheme delivers water to Western Australia’s eastern goldfields, rich in the precious metal but lacking in that most precious of resources – freshwater. Water from a dam (Mundaring Weir) on the outskirts of Perth is lifted by a series of pump stations through a steel pipeline to its destination 560 km east. It has been operating in this way for more than 100 years and the intention is it will continue to do so for another 100. Today a network of pipes radiates north and south of the original west – east pipeline. The scheme was built when 30 000 people resided in the goldfields centred around Coolgardie and Kalgoorlie, as they do today. But, thanks to the 8000 km leading off the main conduit, 100 000 people rely on it nowadays. It guarantees a secure water supply for those living in the Wheatbelt that supplies half the nation’s wheat. And millions of sheep. At the time of its construction (1898 – 1902) many thought the scheme would fail in its purpose to lift water higher and deliver it further than had been done at the time. Today it is recognised as an engineering wonder. The current scheme is operated and maintained by the Water Corporation while the National Trust in Western Australia conserves historic elements, making them and the history of the water supply accessible to the public.